Seventeen year old Iliad Piper is named after war and angry at the world. Growing up with a violent father and abused mother, she doesn’t know how to do relationships, family or friends. A love hate friendship with Max turns into a prank war, and she nearly destroys her first true friendship with misfit Mia. Iliad takes off her armour for nobody, until she meets Jared, someone who's as complicated as she is. Spousal and family violence is predominant throughout our communities. Aggressors are habitually husbands and fathers, wives and children persecuted by noxious, patriarchal male dominance exasperated by alcohol or substance abuse. The Build Up Season narrative accompanies seventeen year old Iliad Piper on her journey, a tormented and indignant young woman. Although Iliad was educated at boarding school after her mother and father separated, she now lives in Darwin with her surly grandmother and mother, a new age healer specialising in spiritual wellness. Iliad's narrative is one that resonates profoundly, confrontational and resembling my own childhood experiences. Iliad is a family violence survivor. Family violence and abuse is a confronting narrative, Iliad is a young woman who harbours animosity towards her mother for raising her in a violent environment, her mother a woman who endured years of physical and emotional spousal abuse. Her husband is possessive, manipulating Iliad to degrade her mother with contempt. Iliad's fear is palpable, the unease of her father pursuing them to Darwin where her mother is a small business owner specialising in spiritual health. The trepidation of leaving everything behind to begin a new life is daunting and while Iliad and her mother were fortunate to have the financial assistance of Iliad's grandmother, funding Iliad's private school education, many women escaping violence are placed in shared housing for family violence survivors, a haven for women and children who otherwise were not afforded the same assistance. Jared is a character of contrasts. He appears to be a charismatic young man but underneath he's manipulative and noxious. He's easily angered, jealous and possessive of Iliad. It was reminiscent of the relationship between her parents and although often Iliad felt nervous of Jared's behaviour similar to many victims of violence, believed she was responsible for Jared's actions. Throughout the narration, Iliad has a long running rivalry with Max. I adored Max. He's an intelligent and aspirational Indigenous young man of Bininj and Anmatyerre heritage from the Northern Territory. Max faces his own adversity and as the two call a truce, develop a wonderfully caring friendship. Iliad's friendship with Max was a positive experience, his family welcomed Iliad into their home with Max a testament to his loving and close knit family. The essence of The Build Up Season is new beginnings and learning to forgive, reiterating the importance of holding perpetrators of violence accountable. The narrative although confrontational, are incredibly important for adolescents. If you haven't experienced family violence, it's likely you unknowingly know someone who has. 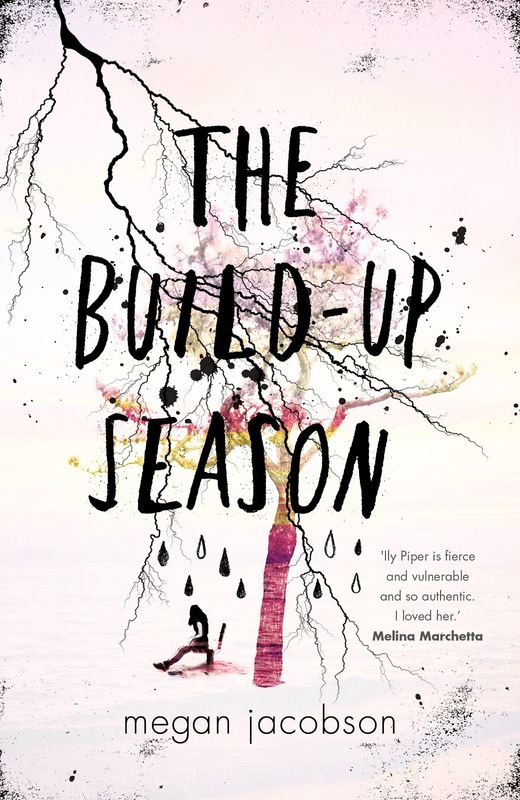 The Build Up Season is the book I wish I'd had as a teen, an important discussion as a community in support of those family violence has touched. 1800 Respect is funded by the Australian Government’s Department of Social Services to provide support for people experiencing, or at risk of experiencing, sexual assault, domestic or family violence, their friends and family, workers and professionals supporting someone experiencing, or at risk of experiencing sexual assault, domestic or family violence. This is a confidential service available twenty four hours a day, seven days a week. Lifeline Australia is a national charity providing all Australians experiencing a personal crisis with access to twenty four hour crisis support and suicide prevention services. Kids Helpline is Australia’s only free, private and confidential twenty four hours, seven days a week phone and online counselling service for young people aged five to twenty five. Thanks so much for sharing. This sounds like a really intense, but definitely important read. I think Illiad's relationship with Jared would be interesting to read about since it stats to mirror her parents. I'm also curious about Illiad and her mother and how they get on, since Illiad's father kind of "turned her against" her mother, if you will - or so it seems. Thanks again for sharing. I need to read more Aussie fiction. They have quite a turbulent relationship Lauren, she unknowingly seems to blame her mother for raising her in a violent environment, not understanding that domestic violence isn't always as easy as simply walking away from the relationship. She begins to understand through her relationship with Jared how difficult it is. Such an important and influential read Lauren, I would love to see your thoughts. It is Vanessa but also has wonderful moments of warmth and humour. Such an important narrative and I appreciate books like The Build Up Season being able to encourage discussion on family violence. An issue that's prominent throughout our communities but continues to be relatively unspoken about. Wow this does not sound like a light read, but it definitely sounds like something that is important to read about and thank you so much for sharing! I will definitely keep an eye out for The Build Up Season. Great review! Thanks Lara. It's a wonderful read for a magnitude of reasons. Because it's an important discussion for the wider community but also for young women to see the early signs that they may be involved in a toxic or manipulate relationship. It's the book I needed as a teen. Why do you always find these really amazing books which I want to read after your review only to learn they aren't out here in the UK? This definitely sounds like an intense read, spousal abuse and violence in the home is not an easy thing to read. This sounds like such an interesting book, though. Exploring how it has an impact on those who have escaped an abusive home. I am adding this to my TBR and I will definitely try and get a hold of a copy. It's something that resonated deeply with me Becky and I can't recommend this highly enough. You can actually purchase the Australian published copy through The Book Depository. They stock a lot of the #LoveOzYA titles I read. It has been SO long since I read a YA about abuse, but these books are super important. I've never heard of this before, but I'm definitely going to add it to my TBR. If I got anything from this review, it's how REAL this story sounds. Thanks for sharing, lovely! It's so, so important Aimee but underneath the heavy theme of domestic violence is the coming of age narrative also about a girl reconnecting with her mother. The Darwin location was incredible. woah does this book pack a punch, it sounds important and a topic that is not very heavily covered in YA fiction but I think is something that needs to be said especially in todays world. great review! Thanks Lily and couldn't have said it better myself. Such an important narrative. Thank you so much for sharing this beautifully written review. Family abuse if defiantly a serious issue, whether physical, emotional, or sexual. I've been looking for a good one to pick up and review on my blog, and I think that this just might be the one. It's a brilliant read Anna and so wonderfully written. I can't wait to see what you think of it! Wow, I already had this on my TBR but now I think I really need to pick it up soon. It sounds like a really intense read, but it's so good to hear that the author wrote honestly about these confronting issues. Another book which sounds similar that I loved was 'The Gulf' by Anna Spargo-Ryan - also by an Aussie writer! I have that one on my shelf too Eugenia and looking forward to reading it shortly. The Build Up Season is truly incredible, I wish I'd had this as a teen. This is a great review of a great, powerful, important book. I adore Max, and Iliad was such a complex character. She was truly wonderful wasn't she. Even as an adult reader, I seen so much of my adolescent self within her. I'm quite intrigued about this book, it seems like it's really intense but with an important message, need to check this one out! It's such an important read, I'd love to see what you think of it! Whew. You certainly are finding confronting and emotional reads, Kelly. I keep staring at the cover -- sometimes I think it's could be a beautiful painting, and other times I think it's the most melancholy thing (and fitting) for the book. It's beautiful isn't it and a great representation of live, enduring the storms and still hopeful. Wow this sounds like a powerful and heartbreaking read. Sorry you were able to relate to this but Im glad abuse isnt being used in this case as a plot twists like so many authors like to do. It was so wonderfully written and essentially about moving forward and learning to forgive yourself. We need more books like The Build Up Season in young adult, it's essential reading. You've been reading a lot of heavy books lately. This sounds like a great read, I'm not sure if I have it in me to pick this up myself (I'm not a fan of reality at the moment!) but I'll definitely keep it in mind. I have come to think of it. I think I go through moods of needing that emotional release. This one is amazing. It truly is Shannon and we desperately need more realistic and often confronting experiences in young adult to promote understanding and for others to see themselves reflected. Such a brilliant read. I only just heard about this and instantly added it to my to-read list. These books are so important and need to be read. Thank you for a wonderful review and adding the helplines to the end in case anyone needs them. It's such a shame that they are even needed. I look forward to reading this. So important to share all experiences isn't it, rather than just the light, happy ones. I can't wait to see what you think of it Rochelle!